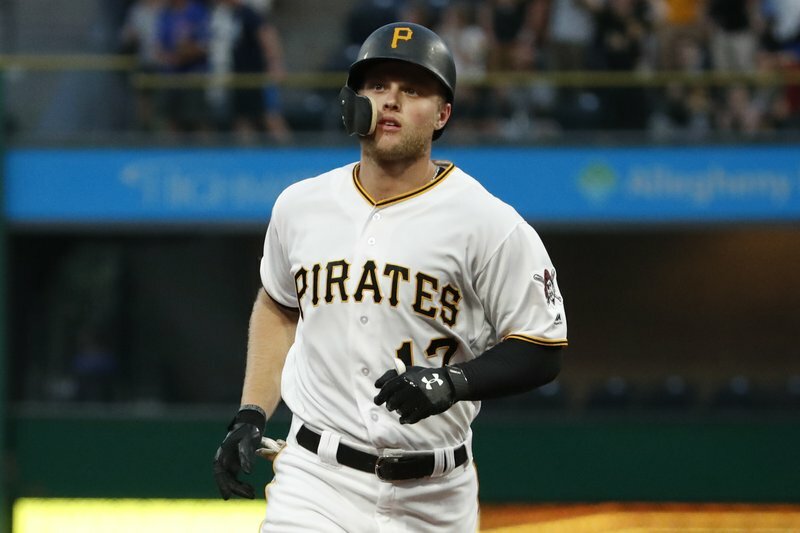 PITTSBURGH (AP) — The “Wow” moment didn’t come when Austin Meadows received the news the Pittsburgh Pirates were calling him up to the majors. It didn’t come when the outfielder’s extended trek to the majors ended when he stepped into the batter’s box for the first time as a big leaguer on May 18 in front of an appreciative PNC Park crowd that included hundreds dressed up as “Star Wars” characters as part of a promotion. “I didn’t really expect that,” Meadows said with a laugh. That might be the only thing that’s caught the 23-year-old off-guard. Long considered the eventual heir to Andrew McCutchen before a series of injuries at Triple-A slowed his progress, Meadows has been a revelation. He entered Wednesday hitting .417 with four home runs, six RBIs and two stolen bases while basically forcing the Pirates to keep him even after Starling Marte — whose trip to the disabled list opened up a roster spot for Meadows — was activated over the weekend. Meadows’ splashy start led general manager Neal Huntington to stress the decision not to send him back to the minors wasn’t so Meadows could simply fill in. One in which Meadows will be a vital and versatile part. He’s already seen time at all three outfield positions at spacious and quirky PNC Park. Meadows credited Marte and outfield coach Kimera Bartee for giving him a crash course in how to navigate everything from the massive expanse of left field to the 21-foot high Roberto Clemente Wall in right. When Chicago’s Anthony Rizzo hit a solo home run to the first row of seats Tuesday night, Meadows alertly raised his arms to ask manager Clint Hurdle to challenge the call. A fan dressed in Cubs’ gear stood at the railing and snagged the ball out of midair. Though the homer stood upon review, Meadows’ presence of mind on his 11th day as a big leaguer — and his second start in right — is symbolic of the player the Pirates thought they were getting. They made the then-teenager from suburban Atlanta the ninth overall pick in the 2013 draft. Meadows originally committed to play at Clemson before signing a $3 million signing bonus to join the Pirates, a decision that came with a significant amount of expectations. He joined a pipeline that produced McCutchen, Marte and Gregory Polanco, the “outfield of the future” when Pittsburgh began its renaissance from afterthought to contender earlier this decade. Meadows’ arrival earlier this month — unlike the arrivals of former coveted prospects McCutchen, Gerrit Cole and Polanco — was met with more of a shrug than breathless anticipation. That might not necessarily be a bad thing. It allowed the unassuming Meadows to fit in quickly in a clubhouse that’s undergone a significant overhaul since it made three straight playoff appearances from 2013-15, including McCutchen’s departure in a trade to San Francisco in January. Make no mistake: Meadows is not McCutchen and isn’t trying to be McCutchen. He does, however, believe he belongs. So do his teammates. And he’s raking. The player who never hit more than 12 home runs during any season in the minors already has four less than two weeks into his major league career, That includes a shot to right-center on Tuesday night off Chicago ace Jon Lester, the first homer Lester has given up to a lefty all season. Yet it wasn’t even Meadows’ most impressive feat of the night. That came in the ninth against Cubs closer Brandon Morrow. Pittsburgh had two on with one out and trailed by four when Meadows stepped in. Meadows fended off four sinkers at 98 or 99 mph before lining an infield single that loaded the bases and kept a Pittsburgh rally alive. “If you’re not impressed by Meadows’ at bats, you need to go watch another sport right now,” Hurdle said. Meadows is doing his best to take everything in stride. For all his early success, he’s quick to point out the team has slumped since his arrival. He’s no savior. just one of 25 trying to do his part for a club that believes — if few others do — that it can contend in the stacked NL Central. He probably won’t hit .400 all season. He probably won’t hit a home run every third game. He’s well aware getting up here and staying up here are two entirely different things. It’s a challenge he’s been preparing for since the first time he picked up a bat when he was 3. The stakes have changed. His mindset has not. “You can’t have any fear up here,” he said.